the monovalent radical NH2, when not united with an acid radical. amino acid any of a class of organic compounds containing the amino (NH2) and the carboxyl (COOH) groups, occurring naturally in plant and animal tissues and forming the chief constituents of protein. Twenty amino acids are necessary for protein synthesis. Eleven (the nonessential amino acids) can be synthesized by the human body and thus are not specifically required in the diet: alanine, arginine, asparagine, aspartic acid, cysteine, glutamic acid, glutamine, glycine, proline, serine, and tyrosine. Nine (the essential amino acids) cannot be synthesized by humans and thus are required in the diet: histidine, isoleucine, leucine, lysine, methionine, phenylalanine, threonine, tryptophan, and valine. Structural formulas for some representative amino acids. From Applegate, 2000. Protein foods that provide the essential amino acids are known as complete proteins; these include proteins from animal sources, such as meat, eggs, fish, and milk. Proteins that cannot supply the body with all the essential amino acids are known as incomplete proteins; these are the vegetable proteins most abundantly found in legumes (peas and beans), as well as certain grains. Because different incomplete proteins lack different amino acids, specific combinations can provide all of the essential amino acids. In certain inherited or acquired disorders of metabolism, specific amino acids accumulate in the blood (aminoacidemia) or are excreted in excess in the urine (aminoaciduria). Urinary amino acid levels are increased in liver disease, muscular dystrophies, phenylketonuria (PKU), lead poisoning, and folic acid deficiency. An organic acid in which one of the hydrogen atoms on a carbon atom has been replaced by NH2. Usually refers to an aminocarboxylic acid. However, taurine is also an amino acid. /ami·no ac·id/ (ah-me´no) one of a class of organic compounds containing the amino (NH2) and the carboxyl (COOH) groups; they occur naturally in plant and animal tissue and form the chief constituents of protein. branched-chain amino acids leucine, isoleucine, and valine. essential amino acids the nine α-amino acids that cannot be synthesized by humans but must be obtained from the diet. nonessential amino acids the eleven α-amino acids that can be synthesized by humans and are not specifically required in the diet. Any of various compounds containing an amino group (NH2), a carboxylic acid group (COOH), and a distinctive side chain, especially any of the 20 amino acids that link together to form proteins. Some amino acids (called nonessential) can be synthesized in the human body, while others (called essential) must be obtained through the diet. an organic chemical compound composed of one or more basic amino groups and one or more acidic carboxyl groups. A total of 20 of the more than 100 amino acids that occur in nature are the building blocks of proteins. The eight essential amino acids are isoleucine, leucine, lysine, methionine, phenylalanine, threonine, tryptophan, and valine. Arginine and histidine are essential in infants. Cysteine and tyrosine are semiessential because they may be synthesized from methionine and phenylalanine, respectively. The main nonessential amino acids are alanine, asparagine, aspartic acid, glutamine, glutamic acid, glycine, proline, and serine. From their structures, the amino acids can be classified as basic (arginine, histidine, lysine), acidic (aspartic acid, glumatic acid), or neutral (the remainder); each group is transported across cell membranes by different carrier methods. Individual amino acids represent the monomeric units that can be connected via peptide linkages (amide bonds) to produce polymeric structures called proteins according to the scheme below. Fig. 28 Amino acid . Structure of a generalized amino acid. Fig. 27 Amino acid . The 20 amino acids commonly found in protein, with the three-letter and, in brackets, one-letter abbreviation for each. a building block of protein, containing a carboxyl group (COOH) and an amino group (NH2), both attached to the same carbon atom. Over 80 amino acids are known to occur naturally, with 20 found commonly in proteins (see Fig. 27 ), each with a different side chain, called an ‘R’ group (see Fig. 28 ). Each of these common amino acids is described under its own heading. Many amino acids can be synthesized in the body from other amino acids by a process called TRANSAMINATION, although most organisms have a number of ESSENTIAL AMINO ACIDS that must be taken in with the diet. Each amino acid is coded by at least one triplet of DNA bases (see GENETIC CODE), and the string of amino acids making up a protein is joined by PEPTIDE BONDS to form a POLYPEPTIDE CHAIN. The sequence of amino acids is the PRIMARY STRUCTURE. Amino acids are soluble in water but vary considerably in their solubility. When in solution they are ionized (see ZWITTERION) and generally are electrically neutral with a pH known as the ISOELECTRIC POINT. They are amphoteric, i.e. acting as acids or bases if the pH is shifted. Amino acids are small molecules that are used as building blocks for all proteins. Some amino acids are also used in the body for the manufacture of hormones. There are about 20 nutritionally important amino acids, including glutamic acid, glycine, methionine, lysine, tryptophan, serine, and glycine. n an organic acid in which one of the CH hydrogen atoms has been replaced by NH2. Amino acids are the building blocks of proteins. n the group of amino acids that cannot be synthesized by the organism but are required by the organism. They must be supplied by the diet. Isoleucine, leucine, lysine, methionine, phenylalanine, threonine, tryptophan, and valine are essential for adults; these eight plus arginine and histidine are considered essential for infants and children. n the group of amino acids that produce enzymes that may be converted to glucose if necessary. n an amino acid that produces ketone bodies following chemical alteration of its carbon skeleton. n the group of amino acids that can be synthesized by the organism and are not required in the diet. n an accumulation of amino acids in the liver and blood that adjusts to meet the body's need for protein and amino acids. any one of a class of organic compounds containing the amino (NH2) and the carboxyl (COOH) group, occurring naturally in plant and animal tissues and forming the chief constituents of protein. In certain inherited or acquired disorders of metabolism, specific amino acids accumulate in the blood (aminoacidemia) or are excreted in excess in the urine (aminoaciduria). Urinary amino acid levels are increased in liver disease, muscular dystrophies, phenylketonuria (PKU), lead poisoning and folic acid deficiency. 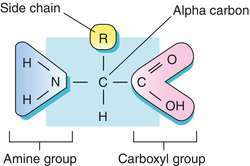 those containing carboxylic acids in their side chains, e.g. aspartate and glutamate. amino acids containing side chains that accept protons at physiological pH, e.g. lysine, arginine, and histidine. an enzyme which contributes significantly to the total production of ammonia in the body. the amino acids which animals must ingest with their diets and which vary between species and physiological status. The commonly accepted list of essential amino acids includes arginine, histidine, isoleucine, leucine, lysine, methionine, phenylalanine, threonine, tryptophan and valine. Birds also require glycine and cats require taurine in their diets. amino acids free in the blood, providing an available source for all tissues for catabolism. an amino acid which yields either pyruvate or oxaloacetate and glucose synthesis can occur. an amino acid whose carbon skeleton yields ketone bodies; leucine is an example. the effects may be the same as a deficiency of total protein, reduced growth and production, reduced food intake, loss of body weight, but deficiencies of individual amino acids may have specific effects, e.g. taurine in cats. See also methionine, lysine, arginine. methionine has caused growth retardation and cervical paralysis in turkey poults. a decreased ratio of branched chain to aromatic amino acids in plasma can be used to detect chronic liver disease or portacaval shunts in dogs. automatic machine for determining the amino acid sequence of a protein. essential amino acids containing sulfur, cysteine, cystine and methionine. analysis may be used to detect inherited disorders of metabolism, such as cystinuria, tyrosinemia and citrullinemia. Q. what are Amino Acids and what are their for? how do i need to do to keep it "going "? A. Amino acids are the basic structural building units of proteins. They form short polymer chains called peptides or longer chains called either polypeptides or proteins. The process of such formation from an mRNA template is known as translation, which is part of protein biosynthesis. Twenty amino acids are encoded by the standard genetic code and are called proteinogenic or standard amino acids. Other amino acids contained in proteins are usually formed by post-translational modification, which is modification after translation in protein synthesis. These modifications are often essential for the function or regulation of a protein; for example, the carboxylation of glutamate allows for better binding of calcium cations, and the hydroxylation of proline is critical for maintaining connective tissues and responding to oxygen starvation. For full article: http://en.wikipedia.org/wiki/Amino_acid Hope this helps. To verify the precision of our technique, we determined mean CVs for each amino acid tested. According to the ideal protein concept, amino acid profile is expressed relative to lysine content, because lysine is usually the first limiting amino acid and exclusively used for body protein synthesis. A number of methods have been applied for the determination of amino acids in soil samples. Wang, "Construction and application of the weighted amino acid network based on energy," Physical Review E, vol. c) The essential amino acid score based on suggested school child requirement . However, the team thinks its unlikely amino acids could have survived the conditions that created the meteorite, which endured higher temperatures more than 2,000 degrees Fahrenheit (over 1,100 Celsius) over a much longer period. An artificial amino acid can provide an extra "chemical handle" on an otherwise normal molecule, says Ho Sung Cho, chief technology officer of the California biotech company Ambrx (founded in part by Schultz, who is a stockholder). Leucine, isoleucine and valine, known as branched-chain amino acids (BCAAs), account for a fraction of the 20 amino acids from which proteins are made, but appear to have anti-ageing properties. If in certain cases a particular amino acid is required, the production of other amino acids being produced at the same time ceases trough a complex regulatory control (Clarie, 1998). Lysine is a metabolically indispensable amino acid. Methionine is an essential amino acid and cysteine is not. Of these, 12 were synonymous and 3 were nonsynonymous substitutions resulting in amino acid changes (E19 Thr/Pro, E226 Ile/Thr, and E329 Ala/Val).